The President has been speaking about the 75,000 people who lost their lives in the brutal civil war in El Salvador. PRESIDENT HIGGINS WILL visit the tomb of murdered Catholic archbishop Oscar Romero on the final day of his visit to El Salvador today. 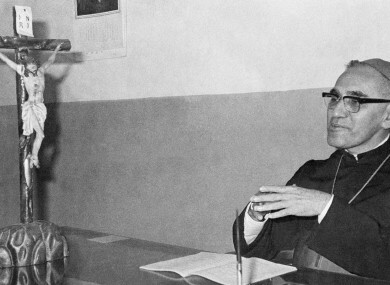 Archbishop Romero became a symbol of the country’s brutal and sustained civil war after he was shot dead in the city of San Salvador in 1980 as he was celebrating mass. He had been outspoken about horrific human rights abuses carried out by the ruling regime. An estimated 75,000 people died between 1980 and 1992 in El Salvador’s civil war as the US-backed government and military killed and tortured its own population. Michael D Higgins, who had previously visited the country in 1982, delivered a speech last night in which he spoke about memory and paying tribute to people who fought against the regime. In it, he described how the country’s social fabric was torn apart by the conflict. “Theirs was a struggle for greater social justice that included emancipation from poverty, access to land, and the basic means of livelihood for the poorest Salvadorans,” he said. ‘Why care?’ – some could be tempted to ask; ‘it is a thirty years old conflict.’ But for those who have lost a loved one, it does not matter how many years have passed. The questions and pain are always present, for there is no greater object of sorrow, nothing more upsetting than a human life not being allowed to bloom to its full potential. The naming of each and every one of those who died or was made to ‘disappear’ is of the utmost importance. This is something I personally feel strongly about, and it is why I opened one of my poems from the 1980s, entitled Memory, with a line from French philosopher Paul Ricoeur, which simply said that ‘to be forgotten is to die twice”. Later today he will also visit the Monument to Memory and Truth which commemorates all the people who died during the conflict. The President will travel to Costa Rica tomorrow for the final leg of his 12-day official visit to Latin America. He is due to return to Ireland on 31 October. Email “Michael D Higgins to visit tomb of murdered bishop Romero”. Feedback on “Michael D Higgins to visit tomb of murdered bishop Romero”.